Burmester celebrates 40th anniversary by launching its first turntable | What Hi-Fi? The Burmester 175 is a full record-playing package that includes arm, cartridge, power supply and phono stage. Impressively, Burmester makes every part. Despite being a first attempt, this is an ambitious design in every respect. Look beyond the characteristically chunky metal plinth and you’ll find a platter that sandwiches a disc of brass between two aluminium layers. This platter is then lined with bitumen to reduce resonance further. It sits on a precision-machined bearing that is designed to be maintenance free for life. 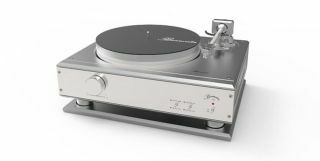 Considering Burmester products tend to give service that’s measured in decades rather than years don’t be surprised if this turntable outlasts its owners. Unusually, the Burmester 175 has four drive motors. These AC motors are positioned around the sub-platter and use multiple belts to ensure an even pull on the main bearing as well as a rapid start-up. The deck’s power supply is engineered so that the rotational speed isn’t affected by mains fluctuations. The tonearm is a nine-inch unit that uses a mixture of carbon and aluminium in its arm tube, while its bearing is a hybrid of steel and ceramic. The Burmester cartridge feeds the 175’s internal phono stage. This electronic circuit is based around the company’s highly regarded 100 outboard unit, and is carefully designed to minimise hum and noise. The complete 175 turntable package weighs in at a hefty 60kg and stands on three magnetically isolated feet. These are engineered to minimise the amount of environmental vibrations that enter the deck’s structure. The result should be better sound quality. How much for this engineering marvel? The Burmester 175 record player package is expected to cost around €30,000 and should be available towards the end of this year.